As the days grow shorter, Autumn can be a difficult time of year for many, with sadness, apathy and coughs and colds creeping in; for others, it is simply overlooked as we slide from Summer to Winter. This is, in fact, the most precious time of year for laying the foundations for our future well-being. To reap the benefits of Autumn, there is work to be done. We must let go of the active energy of Summer and turn our awareness inward to prepare physically and energetically for the stillness of Winter. Then the dark, cold season is transformed from a time of low vitality, debilitating illness and depression into a deeply restorative period. And, with our cup refilled, we can re-emerge in the Spring full of creative energy, vision and hope, ready for a new cycle of busy activity. 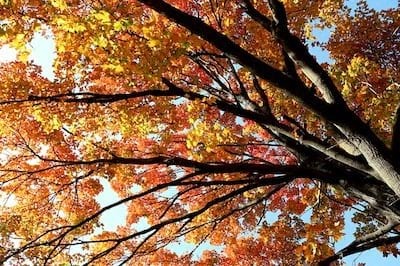 The natural world is the best teacher of how to move through Autumn (or any season) in a harmonious way. As we shift from Summer into Autumn, the trees dim the lights of their vibrant green display, for they know they cannot shine indefinitely without running dry all their resources. Instead, they turn inwards and to begin the process of preparing for the colder months. They concentrate any waste products into leaves that will dry out and be shed. And they draw the juicy sap that contains their essential ‘seed’ energy deep down into their roots to be protected, conserved and replenished during their regenerative Winter dormancy. So Autumn is the season of contraction, distillation, refinement and storage, of separating the impure from the pure and of then shedding the excess and carefully conserving the essential to be protected and nurtured. Every plant’s flourishing in the next growth season depends utterly on the thoroughness of this transformative autumnal work. So, after the heat and vibrancy of Summer (or any periods of expansive activity and expression), we too need to consciously turn inwards towards stillness and quiet. It can be hard to let go of heart-opening expansion, for turning away from the light and towards the darkness can feel depressingly like moving towards death. But this transition is vital if we are not to stagnate or squander all our resources. And turning in is not just a matter of collapsing exhausted (as so many people do) into rest. We then miss out Autumn’s vital refining and so cannot sink undisturbed into deep rest and reap Winter’s full restorative benefits. In Autumn (or at any time when we need to dim our own lights) we, like the plants around us, must sort the pure from the impure. So it is our season of accountability, when we look back – not to wallow nostalgia or stay attached to past sorrows – but to learn to use the past to go towards a more brilliant and joyful future. It is the time to honestly remember and reflect on what has gone and to look straight in the eye all the unresolved griefs and the uncomfortable truths buried inside us. And to give ourselves the quiet space to sit with them until we draw out their precious essential meaning for our lives. This autumnal reflection is our chance to judge what really does and does not belong in our own particular life, so we can cut out the excess, like falling leaves, and return to what is essential to us. As in nature around us, this process is the source of our future cycles of growth and expansion. For, by drawing meaning from even our most sorrowful experiences and refining our lives back to what really matters to us, we lay the foundations for living more joyfully as we walk our truest selves out into the world. Autumn equates with the Metal element in Chinese philosophy – so think of the metal sword slicing, cutting through, separating, threshing. But think too of alchemy and the treasure that makes that challenging refining process worth it. In the whole cycle of the Five Elements, Metal is perhaps the most precious phase of all. This energy of turning in and contracting may feel like going towards death, but it is actually the return to source. And it is that return that sews the seed for all that is to come in our next cycle of living. In Chinese philosophy, the Lungs and the Large Intestine together govern Autumn’s refining process. These two organs are intimately linked in their energetic and physical elimination and assimilation functions (sorting the pure from the impure). If they fail to get rid of what is excessive or to hold on to what is essential, then imbalance and ill-health prevail. Physical symptoms may appear, particularly in the Lungs or Large Intestines (such as frequent coughs and colds, shortness of breath or intestinal problems), and there is likely to be a general loss of vitality. And on an emotional level, Metal’s contracting energy starts to feel less like a comforting hug and more like a suffocating squeeze. We feel deflated, sad, depressed and lose the will to live our lives. Five Element Qigong can help us to understand the seasonal energies, to become aware of their ebb and flow in our bodies and to nourish the qualities within us needed to bring ourselves into harmony with them. At this time of year (or at any time in our lives when we need to nurture Autumn’s energy of turning in), we first practise regularly the MogaDao Qigong Summer to Autumn series, which draws us smoothly down from Summer’s high energy and into the alchemical process of Autumn. Through the Autumn season, we contintue to focus our Qigong practice on the season’s Metal energy and on tonifying our Lungs ready for Winter. Would you like some direct support in building your Five Elements awareness? – Join one of my Five-Elements Yoga classes or Qigong classes, where each session focuses on the energy of a different Element. Sign Up here for my 4-week trial offer. – Come to see me one-to-one. If you have any questions, get in touch. I’d be delighted to hear from you.